Knowing your business’s break-even point is fundamental in determining whether or not your business venture is successful, failing or ultimately worth pursuing. 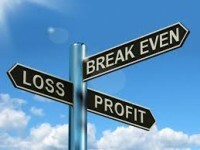 A business’s break-even point is the point at which the business’s total revenue equals the total costs and expenses of running the business. Knowing your business’s break-even point is crucial when determining product rices,setting budgets and preparing business plans. It is the number that determines how much a business can spend and how much it needs to make. Even if a business turns over a lot of money, it could still be making quite a loss. Using the break-even point can help determine this. There are several ways owners can calculate their business’s break-even point. A simplified way of doing so is dividing the business’s fixed costs by its gross profit margin. Every cost a business incurs that doesn’t vary in relation to sales is a ‘fixed’ cost i.e.rent, wages, power and insurance. The gross profit margin is the percentage of sales money that is left over after subtracting the production cost of goods sold from the total sales figure. While this formula can help determine a business’s break-even point, owners should remember that it has been simplified and they may benefit from speaking to a financial professional when considering their business’s profitability.